I looked but I did not find a thread devoted to Brett. The British fungus really deserves some more attention around here. When I was starting out, Brett beers were rare and while they are more common finding a great one can be hard to do. As a beginner as shied away from attempting to use Brett because it is often painted as being difficult or requiring its own equipment. I'd love to hear some peoples' experiences. I have used various Brett strains in about 20 beers. I use the same equipment for everything and I just practice good cleanliness and Starsan everything. I have only ever had it migrate once to a non Brett batch and that was do to poor yeast harvesting practices. I have made 100% Brett brews and mead. I have to say I never found these to be great. They were fun and a pleasure to share with those more adventurous friends, but not great. IMO Brett is fantastic when coupled with a primary set of Sacc. My favorites are Saisons that I add Brett a week into. I really enjoy the Wyeast Belgian Lambic blend but there's a lot going on in there that is not brett as well. I felt the same way about brett-only fermentations, then I got ahold of bootleg biology’s funk weapon 2 and 3. They’re spectacular by themselves. Incredibly estery without getting phenolic, and don’t attenuate much more than regular sacch. FW2 is probably my favorite. It gets a bit tart, so keep bitterness low and load up the whirlpool hops. I had to hide it for about 4 months once bottled because the THP was through the roof, but once that aged out it leaves a fantastic beer. And the hops last pretty much forever. I rely love the surprise of how my Bretts have aged. I have a spot where I hide them that requires a ladder to get to. The only ladder we have is a super heavy little giant collapsable ... so I guess it's not that they are hidden but I'm too lazy to get to them most of the time. A nice exBEERiment at Brülisophy on the difference between staggering your "bug" additions vs combined first pitch. I'm a big fan of Brettanomyces a good portion of my fruit beers are made with brett. The biggest challenge is learning to control it and get the complex flavors you want with it. Pitching rates and pitching times and even tempture make a big difference in the finish beer. Brettanomyces is slow working so I myself use a pitching calculator what regular yeast does in few days Brettanomyces can take weeks ,months or even years to do. Depending on when you want to pitch is where i use the calculator. 4 times Brettanomyces to what ever your pitch calculator says for your regular yeast. Is a great starting point. For instance my beer needs 200 billion regular yeast cells and I want my regular yeast to do the bulk of fermentation with a starting gravity of 1.050 and I decide to pitch my Brettanomyces at 1.020 when my regular yeast is starting to tirer out my Brettanomyces still has some sugar to consume. My large pitch allows for the colony of brett to start working with the yeast to finish the beer. It's kind of the same as Brülisophy stage way giving the brett a chance to start while the regular yeast is fermenting the beer then pitching the rest of the Brett later in fermentation. Both ways work realy well. Just opened a bottle of a 2-hearted clone I fermented with yeast bay’s lochristi blend. I have to say that this brett is fantastic with centennial hops when young, but after a couple of years it’s gotten really phenolic and off-putting. Did a side-by-side with FW2 of about the same age, and although the FW2 batch is pretty tart, it’s darn delicious. Musty pineapple, not too bitter, with refreshing tartness and some wild funkiness. Thick mouthfeel, like drinking a glass of pineapple juice. Going to reculture this yeast from the bottle. This is EXACTLY what I want in a brett ipa. Since you cannot actually taste the earth that vines grow in that yield the grapes in your wine. The Terroir that many people discuss in wines may actually come from the biome of the vineyard and Brett may be a key player in this. I read one article that suggests that the practice of fertilizing the soil in the vineyard with the lees helps reinforce this biome terroir. I imagine before the world became industrial , stainless steel, and pasteurized, terroir was even more pronounced. Kind of what I do since I never clean my Bret keg so I'm sure there is a healthy amount of Bret in the bottom. The Bret was a single strain when I pitched it. I also want to sour my fruit beer but my ESB and Porter comes out great with just the Brett. The yeast bays strain TYB207 is one of my favorites. It's perfect for fruit beers and other styles. It has a sweet tart/mild funk and back notes of fruit to it. I keep it alive and healthy putting it through many beers and it never disappoints. It's consient in flavor profile with each new brew and many batches later it continues to turn out great beer. . I also like Wyeast 3763 Roeslare blend. But there is a flaw with using blends. Since its a blend of Brett, lacto and pedio repitching it does not create the same beer or flavor profile. All three have grown and fighting to dominate and the proportion of brett lacto and pedio have changed and creates something totally different. If you choose to repitch be prepared it might be more pedio than brett or lacto and the sourness can be harsh and acidic. It is funny that "Isolate TYB207 is literally the 207th isolate of yeast/bacteria that has made it through primary fermentation trials"
"Isolated from a unique mixed fermentation beer produced in the Midwestern United States, this Brettanomyces isolate exhibits a mild tartness and soft funk with a solid backbone of tropical fruit esters (papaya, guava, pineapple, guinep). It's great primary fermenter, but really shines in secondary fermentation following up a primary fermentation that produces a lot of flavor compounds. This strain is a true flavor modulator, and the more raw material it has to work with the greater the complexity that will be achieved in the finished beer." You should be fine. The brett and lacto should finish up anything left over and the longer you age it the more flavors the brett will bring out. Commercial lacto tends to be a bit more potent than lab cultures, so you might be ok. I’ve soured with Jolly Pumpkin dregs at around 25 IBU (then again, they might have pedio). So chances are that it’ll be ok. The good thing is that hops don’t actually kill lactic acid bacteria, just inhibit their growth. So if you pitch the culture again in low IBU wort, the lacto will start coming back. But then again, you just might create a hop tolerant lacto, which may or may not be a good thing. 3711 won’t leave much left for the lacto and brett, but it should be enough to keep them going. Brett really just needs a carbon source to make an impact, and it’ll find something in there to metabolize. 3711 is a nice choice for a brett saison, though, since it produces glycerol which helps compensate for such a low terminal gravity. If you find that the culture doesn’t sour enough, pitch it into unhopped wort to promote the growth of the lacto next time. I've got my TYB261 going strong now. I'm making a brett only IPA and the smell coming out of the airlock is that of fruit loops. It could be the El Dorado hops but I think it's the TYB261. 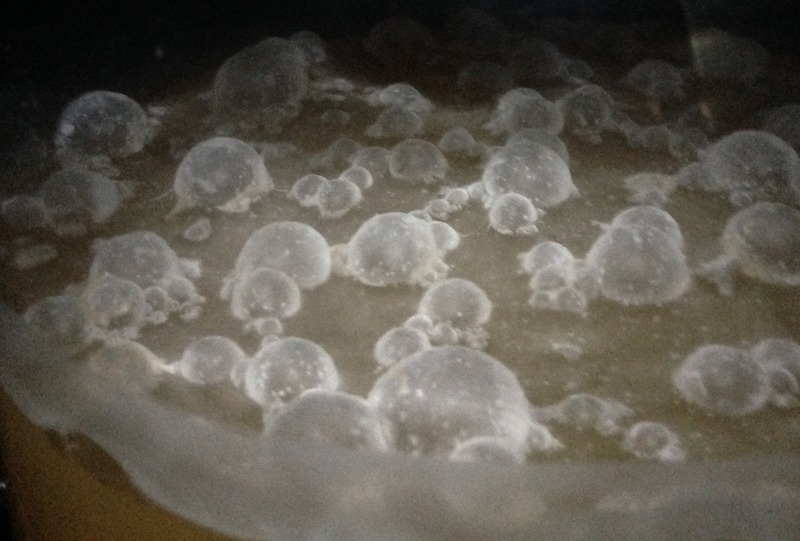 My pellicle that formed this week in a 1 gallon secondary experiment.